Since Jeremy Rosenthal was in high school, he has been practicing the Jewish tradition of designating 1/10th of his income to tzedakah. 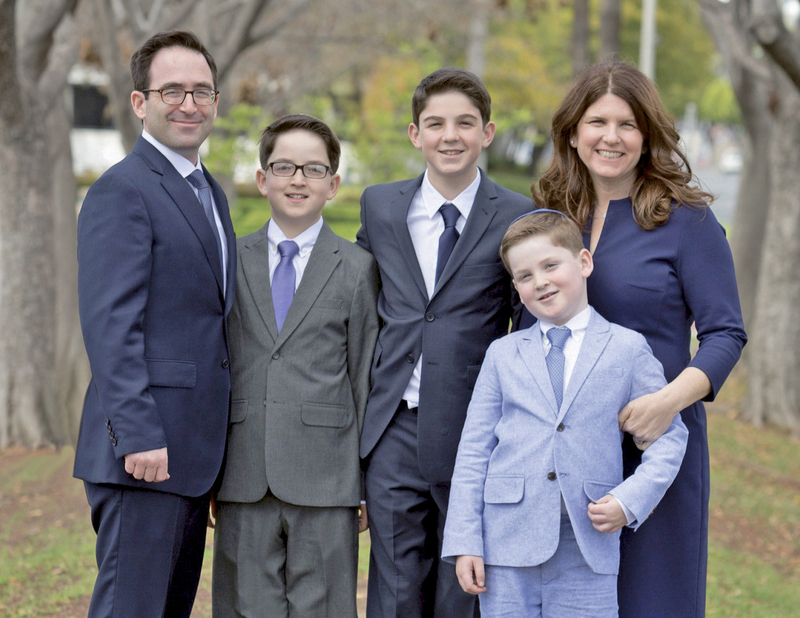 Now a partner at the law firm Sidley Austin LLC, he and his wife, Gwen Rosenthal, a teacher at Pressman Academy of Temple Beth Am, maintain this practice—and pass it along to their sons, Ezra, 13, Micah, 11, and Eli, 8. “We’re making tzedakah a conscious part of our family’s life and budget,” Gwen said. During Chanukah, they invite other families to their home to learn about various charitable causes. After the adults select different charities and give the children money to allocate, each child decides where to donate it based on the causes that resonate with them. “That night’s Chanukkah present is the opportunity to give to the organizations the kids choose,” Gwen explained. For Thanksgiving, the Rosenthals gather friends to pack and distribute upward of 300 lunch bags to people experiencing homelessness. “By making the lunches and delivering them to one person at a time, we can help make philanthropy real and personal to our kids,” Jeremy observed. “We connected with The Foundation to have our giving more meaningfully align with our values,” Jeremy explained. The couple established a Donor Advised Fund, the Rosenthal Family Fund, and uses it to support organizations combatting youth homelessness and hunger, along with Jewish day school and summer camp. Jeremy was also seeking organizations to support as a lay leader. Already a board member of Camp Ramah in Ojai, Jeremy also wanted to help youth in need. He turned to The Foundation for guidance. Elana Wien, VP of The Foundation’s Center for Designed Philanthropy, and her team worked closely with Jeremy through a series of conversations to explore his interests and goals. They connected him with several organizations. After meeting with their leadership, Jeremy joined the board of Youth Emerging Stronger (YES), which works to empower youth who are homeless or in foster care, with housing and support so that they can have flourishing and self-sufficient lives. For the Rosenthals, that meaning starts with what they create at home. Their son, Micah, ran for tzedakah representative of his class and won. “He gets to be in charge of encouraging others to give tzedakah,” Gwen said with pride.